Lynn Hawkins was in commercial real estate and doing very well. After a few months, her boss called her in to his office and told her she was not cut out for sales, she was too nice. Lynn was hurt and questioned if she was doing things wrong, despite her success. That’s when she sought out to learn more. What Lynn learned went well beyond typical sales training. 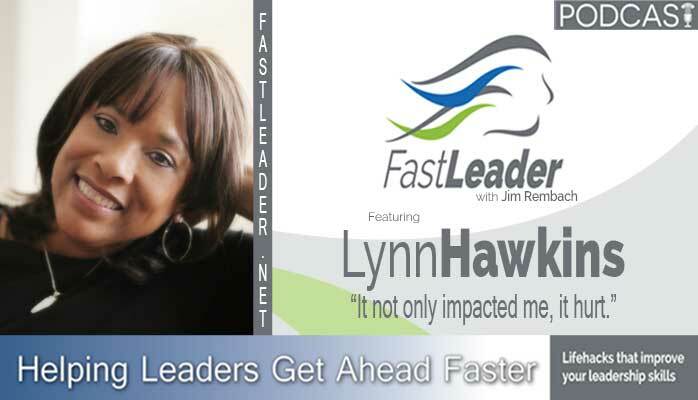 Listen to Lynn tell her story of how she got over the hump and moved onward and upward. Lynn grew up just on outskirts of the inner city of Baltimore, Maryland where she was your typical vibrant little girl until everything shifted in her life. It was the day her father, a man revered in the circles he traveled (fraternity, Church, brotherhoods); with a Master’s Degree in Fine Arts from Johns Hopkins University, a French and Spanish teacher at one of the most prestigious all boys high schools in the city named “City College”, a concert violinist, the father of 2 with another child on the way, dropped dead from a heart attack at the young age of 29. At the time, Lynn was only 7. This caused Lynn to continually feel like everything she loved and worked hard to maintain in her family, her corporate career and initially in her entrepreneurial journey, could be taken away from her at a moments notice. One day, as an adult, she realized that it didn’t have to be that way. And that’s when in 2012, as a single parent, mother of 2 amazing kids, grandmother of 2 beautiful grandsons, her youngest child, father of her two amazing grandsons was killed suddenly. Lynn now finds herself in the very vital role of helping to raise grandsons. Lynn believes that nothing just happens and that everything happens for a reason. Each challenge and every season of Lynn’s life experiences have put her on the journey to her true purpose and path. Now, she teaches what she’s learned … to live the legacy her Dad and her only son left to her … a Legacy of Love. She does that as the CEO of the P3 Academy of Social Entrepreneurship. Lynn currently lives in Lilburn, GA. just north of Atlanta, near Stone Mountain. Business is nothing without the person. Business is a someone, not a something. Being able to reach more. Be the CEO of your business. Being the CEO of my business and standing in that identity.